Here we have a lower bumper fascia on a friend’s 1999 Ford F-150 pickup that was damaged by his teenage son driving the truck into a ditch. The part is only $106, so it wouldn’t make sense for a shop to repair this in a typical situation where the repair costs are covered by insurance, but it demonstrates the steps you’d use for repairing any textured plastic. Clean the plastic with soap and water then 1000 Super Prep plastic cleaner. 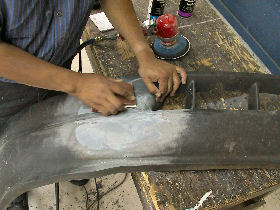 Heat the distorted area with a heat gun and press the plastic back into position. Quench the plastic with a wet rag once you’ve got it reshaped. 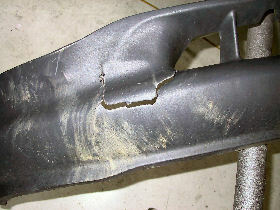 Use a hot air welder and the R13 polypropylene strip to repair the crack on the backside. 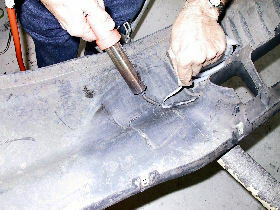 If you don’t have a hot air welder, you can also repair with R10-04-03-BK FiberFlex rod and 2045W Reinforcing Wire Mesh. 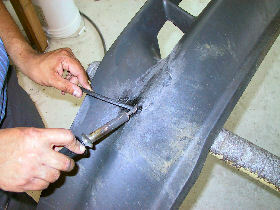 Once the weld on the backside cools, hog out the plastic on the frontside using the 6122 carbide burr. Make the groove about 1/2” wide and at least halfway through the plastic. Scratch up the groove with a 50 grit Roloc and feather back with 80 grit in a DA. 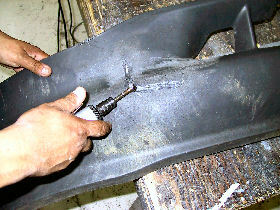 Melt R10-04-03-BK FiberFlex welding rod into the v-groove on the front side. Don’t melt it with the base material; FiberFlex is not a true fusion rod but rather a thermoplastic adhesive that sticks very well to TPO and PP. Once the FiberFlex cools, sand it smooth with 80 grit in a DA. 80 grit tends to make the soft TPO get fuzzy, so sand everything with 180 grit to remove the 80 grit scratches. 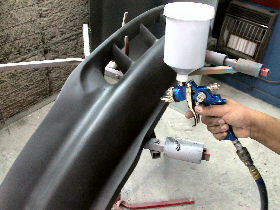 Apply 1060FP Filler Prep adhesion promoter and 2020 SMC Hardset Filler to fill in any low spots and imperfections. Profile with a block, then DA with 180, 240, and 320 grit to remove all the fuzz from the TPO. Blow dust free, apply 1050 Plastic Magic adhesion promoter, then spray on 3803 Flextex VT to simulate the original stippled texture pattern. 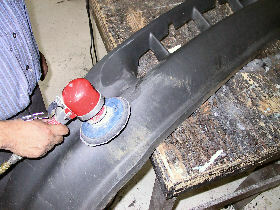 Once dry, lightly rub with medium scuff pad to remove dry spray and cobwebs. 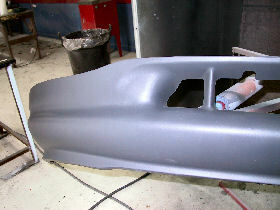 Once you have the texture the way you want it, apply the matching Bumper & Cladding Coat color. B&C Coat matches 41 different shades of gray, making it easy to find a close match for your situation.